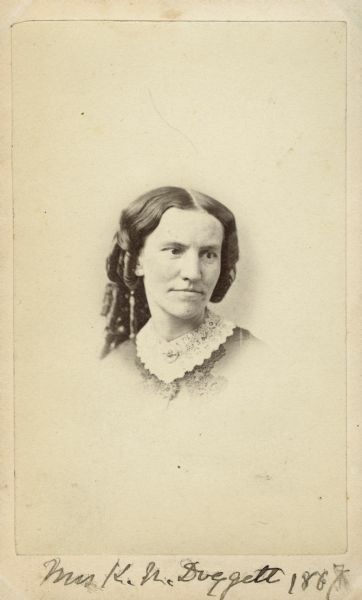 Vignetted carte-de-visite portrait of Kate N. Doggett (1828-1884), American reformer. Took charge of the Academy of Science herbarium in 1869. She was a delegate of the National Women Suffrage Association. She also founded several French and German societies and Fortnightly, a literary society. Handwritten inscription at the bottom reads, "Mrs. K.N. Doggett, 1867." Photographer's credit on back reads, "A. Sonrel, 46 School Street, Boston." From album of portrait photographs collected by Lapham depicting scientists and artists, ca. 1860-ca. 1875. Images include portraits of geologists, botanists, sculptors, and authors.